Are You Heading to the Boardwalk? The Boardwalk is the heart and soul of San Diego’s vibrant beach community, infamous for its people watching and joyful beach goers. Join us for a guided biking adventure through San Diego’s most coveted local communities including La Jolla, Pacific Beach, Mission Beach and Mission Bay. Visit our Bike Tours page for more information. The Pacific Beach Boardwalk lines the coast along the communities of Pacific Beach and Mission Beach and stretches all the way down to the jetty in South Mission Beach. The Boardwalk is full of energy and activity, as it is a popular gathering place for the young locals who make up the majority of the community of Pacific Beach. 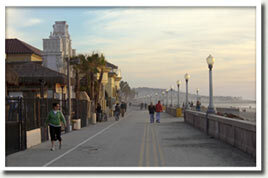 Enjoy the Pacific Beach Boardwalk by rollerblading, biking, skateboarding or simply just walking! Toward the north end of the Boardwalk, there are souvenir shops, great ocean front restaurants, bars and the Crystal Pier. Just north of the Crystal Pier, the Boardwalk ends at the Law Street Park. Belmont Park lies in the middle of the Boardwalk toward Mission Beach, where you can ride the roller coaster or the mechanical wave at the Wavehouse. Belmont Park also has other rides, games, restaurants and shopping on the Boardwalk to enjoy. For a more laid-back scene, head south from the main lifeguard tower to South Mission Beach. The boardwalk passes beachfront homes and condos, ending at the South Mission Beach parking lot where there are typically fewer crowds, making this a great part of the Boardwalk to ride bikes. From here you can ride east, away from the beach, crossing Mission Boulevard to get to the Mission Bay bike path. The Mission Bay path will take you all around Mission Bay, and you can readily cross Mission Boulevard at anytime to cut back over to the Boardwalk. Don’t have a bicycle? No problem! You can rent a bike from San Diego Bike and Kayak. The northern community of Pacific Beach continues to the north and east of the Law Street Park but is visually separated by Crystal Pier; it is quieter and borders La Jolla at its northern most point. North Pacific Beach is home to Tourmaline Beach, a popular surf spot. Pacific Beach is filled with history and beach tradition that we think you will enjoy. Try our San Diego bike tours for a complete tour with our experienced guides of Pacific Beach, Mission Bay, the Boardwalk and Crystal Pier. Pacific Beach has lots of restaurants and shopping, and is a great place to take a break between rides. The boardwalk ends just north of Pacific Beach at a grassy knoll at the end of Law Street. Here you will find a nice quiet area overlooking the ocean to take a break, lie on the grass and enjoy the view. There is also a public restroom here. When you’re ready, return the way you came to the main lifeguard tower.